User Account Control (UAC) is a new security component in Windows Vista and newer operating systems. With UAC fully enabled, interactive administrators normally run with least user privileges. This article and the attached code samples demonstrate these frequently asked coding scenarios related to UAC. 1. How to check if the current process is running as administrator? 2. How to know if the primary access token of the current process belongs to user account that is a member of the local Administrators group, even if it currently is not elevated? 3. How to check if the current process is elevated? 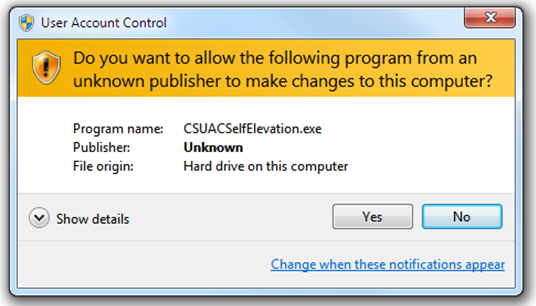 The elevation information is available to only Windows Vista and newer operating systems because there was no UAC and “elevation” before Windows Vista. 4. How to get the integrity level of the current process (System/High/Medium/Low/Unknown)? The integrity level information is available to only Windows Vista and newer operating systems because there was no UAC and “integrity level” before Windows Vista. 5. How to show an UAC shield icon on the UI for tasks that requires elevation? 6. How to self-elevate the current process? 7. How to automatically elevate the process when it's started up? We provide code samples to demonstrate the above how-to scenarios in three programming languages (native VC++, VC#, VB.NET) to meet the needs of different developers. The code samples are part of Microsoft All-In-One Code Framework, which is a centralized code sample solution from Microsoft. You can download the code from the project’s Download page: http://1code.codeplex.com/releases/. Microsoft All-In-One Code Framework delineates the framework and skeleton of most Microsoft development techniques (e.g., COM, Data Access, IPC) using typical sample codes in different programming languages (e.g., Visual C#, VB.NET, Visual C++). Each sample is elaborately selected, composed, and documented to demonstrate one frequently-asked, tested or used coding scenario based on Microsoft’s support experience in MSDN newsgroups and forums. This is a quick demo of the attached UAC samples. Step1. After you successfully build the sample project in Visual Studio 2008, you will get an application depending on the programming language that you are using: CppUACSelfElevation.exe / CSUACSelfElevation.exe / VBUACSelfElevation.exe. Step2. Run the application as a protected administrator on a Windows Vista or Windows 7 system with UAC fully enabled. The application should display the following content on the main dialog. There is a UAC shield icon on the Self-elevate button. Step3. Click on the Self-elevate button. You will see a Consent UI. Step4. Click Yes to approve the elevation. The original application will then be started and display the following content on the main dialog. The Self-elevate button on the dialog does not have the UAC shield icon this time. That is, the application is running as elevated administrator. The elevation succeeds. 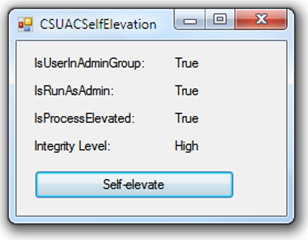 If you click on the Self-elevate button again, the application will tell you that it is running as administrator. Step5. Click OK to close the application. The code introduced in this section is for VC++ developers only. You can find the VC# and VB.NET implementations in the CSUACSelfElevation and VBUACSelfElevation sample packages. 7: //   local Administrators group and it is elevated. 11: //   group and it is elevated. Returns FALSE if the token does not. 14: //   contains the Win32 error code of the failure. 35:     // Allocate and initialize a SID of the administrators group. 50:     // the primary access token of the process. 58:     // Centralized cleanup for all allocated resources. 65:     // Throw the error if something failed in the function. 6: //   Administrators group, even if it currently is not elevated. 10: //   group. Returns FALSE if the token does not. 13: //   contains the Win32 error code of the failure. 36:     // Open the primary access token of the process for query and duplicate. 46:     // previous versions (major version < 6) do not. 56:         // Running Windows Vista or later (major version >= 6). 57:         // Determine token type: limited, elevated, or default. 66:         // If limited, get the linked elevated token for further check. 91:     // Create the SID corresponding to the Administrators group. 101:     // Check if the token to be checked contains admin SID. 104:     // has the SE_GROUP_ENABLED attribute, call CheckTokenMembership. 112:     // Centralized cleanup for all allocated resources. 124:     // Throw the error if something failed in the function. 9: //   function to determine whether a process is run as administartor. 12: //   it is not. 17: //   code will be ERROR_INVALID_PARAMETER. 47:     // Open the primary access token of the process with TOKEN_QUERY. 54:     // Retrieve token elevation information. 63:         // not supported on those operating systems. 71:     // Centralized cleanup for all allocated resources. 78:     // Throw the error if something failed in the function. 4: //   PURPOSE: The function gets the integrity level of the current process. 7: //   called on systems prior to Windows Vista. 14: //     Anonymous group. Blocks most write access. 19: //     registry keys) on the system. 23: //     being launched while UAC is enabled. 28: //     applications if UAC is disabled and the user is an administrator. 37: //   the error code will be ERROR_INVALID_PARAMETER. 57:     // Open the primary access token of the process with TOKEN_QUERY. 67:     // exit cbTokenIL will tell the size of the integrity level information. 75:             // is not supported on those operating systems. 81:     // Now we allocate a buffer for the integrity level information. 89:     // Retrieve token integrity level information. 97:     // Integrity Level SIDs are in the form of S-1-16-0xXXXX. (e.g. 99:     // only one subauthority. 103:     // Centralized cleanup for all allocated resources. 116:     // Throw the error if something failed in the function. 1: // Get the process elevation information. 9: // SHGetStockIconInfo with SIID_SHIELD as the parameter. 4:     // Launch itself as administrator. 16:             // The user refused to allow privileges elevation. If your application always requires administrative privileges, such as during an installation step, the operating system can automatically prompt the user for privileges elevation each time your application is invoked. The application must be started with Administrator privileges; it won't run otherwise. The application is started with the highest possible privileges. 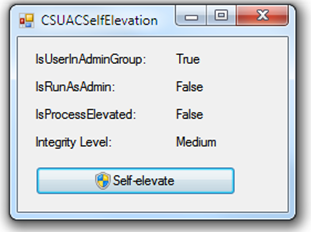 If the user is logged on with an Administrator account, an elevation prompt appears. If the user is a Standard User, the application is started (without any elevation prompt) with these standard privileges. The application is started with the same privileges as the calling application. To configure the elevation level in a VC++ project, open the project's properties dialog, turn to Linker /Manifest File, and select UAC Execution Level. Finally I've found this page. Very good article. This is what I was looking for. Why there is nothing mentioned in MSDN about the differences of being an administrator and being elevated and how to check this?